In 1957, a replica of the Mayflower—the Mayflower II—was built in England based on reconstructed blueprints of the ship from an American museum. It set sail for the United States on April 20, 1957 and arrived in New York City on July 1. Of the original Mayflower‘s passengers and crew, only half survived the first winter in Plymouth Harbor; the rest died from scurvy, pneumonia, and tuberculosis. 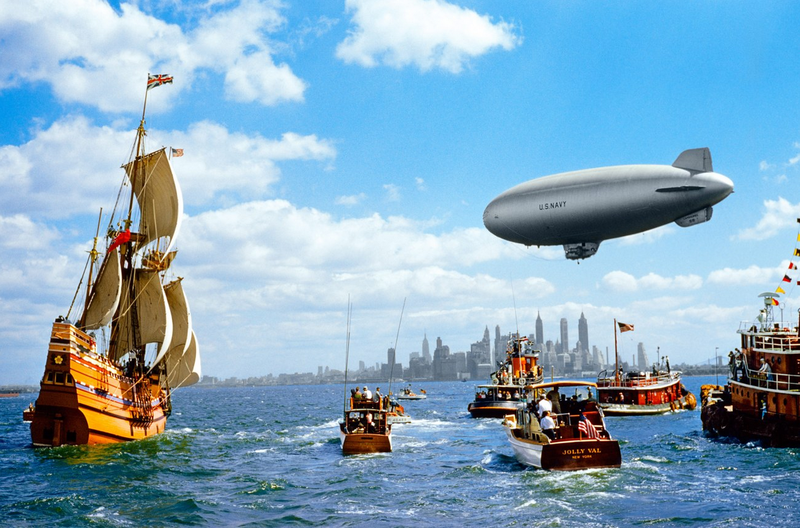 B. Anthony Stewart: The Mayflower II Enters New York Harbor, 1957. Photo from the National Geographic archives. This entry was posted in Uncategorized and tagged 17th Century, 20th Century, Airships, Colonialism, New York City, Photography, Ships & Sailing. Bookmark the permalink.